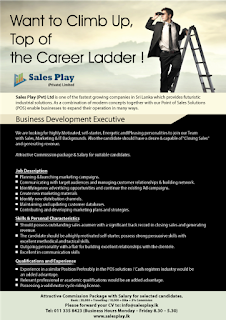 Sales Play (Pvt) Ltd, one of the fastest growing Company which specialized in selling Point of Sales (POS) Software, Billing Machines and providing services to POS Systems. As a combination of modern IT Concepts together with Point Of Sales (POS) Systems, We enable businesses to expand their operations in many ways. We are looking for highly Motivated, self-starter, Energetic and Pleasing personalities to join our Team with Marketing & IT Backgrounds. Also the candidate should have a desire & capable of “Closing Sales” and generating revenue. Attractive Commission package & Salary for suitable candidates. We provide a motor bike and Rs. 10,000 traveling allowance. 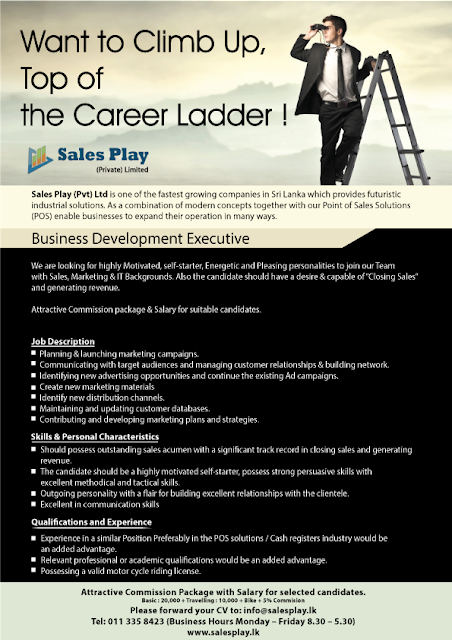 Those interested in this post can forward CVs to: dinesh@salesplay.lk stating “Vacancy – Marketing Department” in the subject line.